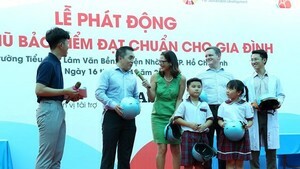 At an annual governmental session yesterday, Vietnamese Prime Minister Nguyen Xuan Phuc requested a strict punishment for school violence following some cases in the country. Because of the recently-recorded cases of school violence in the northern province of Hung Yen, the central province of Nghe An, the southern provinces of Ba Ria – Vung Tau and Soc Trang, PM Phuc asked stricter punishment to keep the regulations. He ordered to impose the decree No.80/2017/ND-CP on safe, friendly education environment and school violence prevention and control and clarify administrators’ responsibilities. Speaking at the meeting, Labor, Invalids and Social Affairs Minister Dao Ngoc Dung said that the highest punishment will be imposed for teachers and teaching staffs who have breached the regulation. School managers will also be held accountable if violence takes place in their schools. Next time, the Ministry of Labor, Invalids and Social Affairs and the Ministry of Education and Training will set up inspection teams on the issue. Meanwhile, Education Minister Phung Xuan Nha said that there has been so far documents on the matter including the decree No.80/2017/ND-CP, PM directive No. 1299/QD-TTg on the project "To build behavior culture in schools for the period 2018-2025." Additionally, the Ministry of Education and Training, the Ministry of Public Security and related governing agencies have issued 11 circulars relating to the issue ban. Nevertheless, implementation of circular has not been strictly performed. Education Minister Nha pointed out some culprits of school violence including students’ low awareness of their behaviors; hence, strict punishment should be imposed on these students to deter them from committing and restoring regulations. Lately, as per documents on teachers’ morality and school discipline reorganization issued lately by the Ministry of Education, teachers will be fined if they violate the regulations, said Education Minister Nha. Minister Nha continued that the Ministry has built detailed action plan to implement the governmental decree No.80 in which also regulates local governments’ duties. However, some administrations have neglected the issue. Cooperation between families, schools and the society is needed to crack down school violence. Next time, the Ministry of Education will work with several agencies to set up inter-department inspection teams to pay visits to schools as well as build psychology programs for schools including extra-activities to release stressful matters and teacher-related issues.